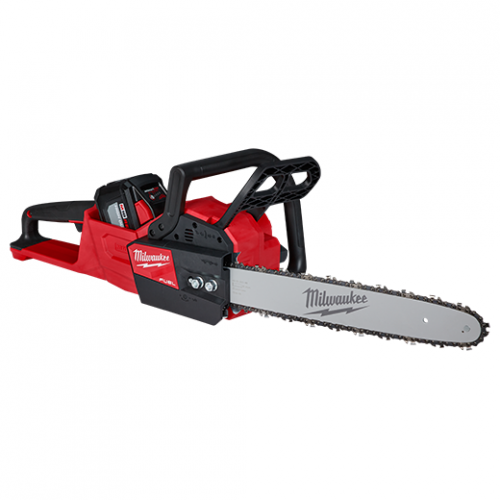 The Milwaukee 2727-22HD ® M18 FUEL™ 16” Chainsaw delivers the power to cut hardwoods, cuts faster than gas, and delivers up to 150 cuts per charge. The unit is designed to meet the performance, durability and ergonomic needs of professional landscape maintenance, power utility, and the installed M18™ user. The POWERSTATE™ Brushless Motor maintains speed under heavy loads without bogging down to outperform small gas engines and higher voltage systems. REDLINK PLUS™ intelligence ensures maximum performance and protection from overload, overheating and over discharge. The M18™ REDLITHIUM™ HIGH OUTPUT™ HD12.0 battery delivers unmatched run-time in all applications. M18 FUEL™ technology allows the unit to reach full throttle in under 1 second providing ultimate control and productivity.